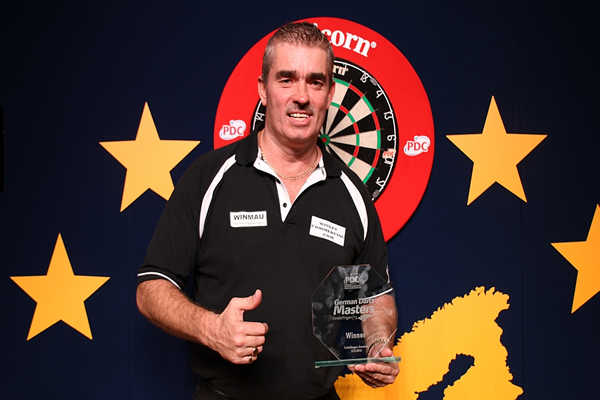 I won the German Darts Masters at the Glaspalast in Sindelfingen at the weekend. My first ranking title for almost four years with a thrilling 6-5 defeat of Mervyn King and needless to say I am over the moon and am really happy with my performance and consistency over the three day tournament. I whitewashed Mick Todd in the first round with a 100 plus average, then defeated Paul Amos 6-1 taking six straight legs to win through to the third round with a 92 average. I then played Jamie Caven winning 6-1 with a 96 average taking out some great shots on the way to book my place in a fourth successive European Tour quarter final. Brendan Dolan was next and after hitting 4 x 180’s on the way to victory and another consistent average of 97, I was well happy to be in another semi final. I then defeated world no 4 Simon Whitlock 6-3 with a 100 plus average, 1 x 13 and 3 x 14 dart legs and another 4 x 180’s, so was feeling really confident going into the final against Mervyn King. 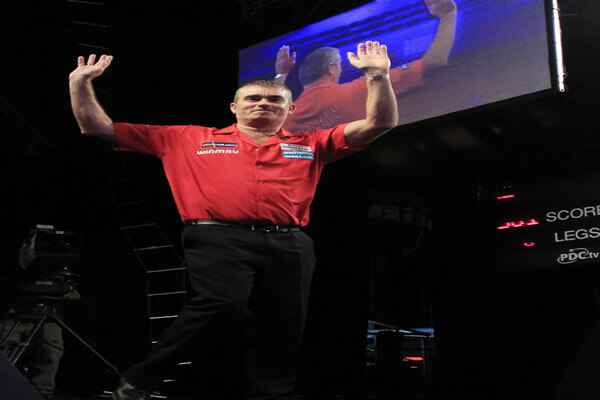 Merv broke throw with a 13 darter in the final’s opening leg. I then broke back to level and took out 70 to lead 2-1. Merv finished 116 to take the fourth, I then edged back ahead with an 11 darter before Merv punished me for missing double tops to level. I took the next leg to make it 4-3 and the following one after Merv burst his score with a sensational 160 checkout to make it 5-3. 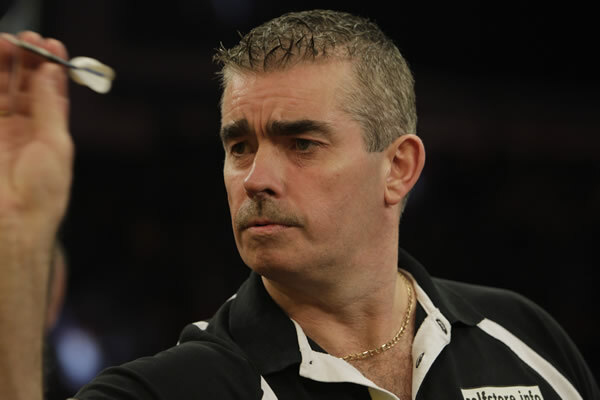 Merv came straight back to taking the next two legs to take it to a decider. I was the first to a double and took 76 out on tops for the title. I sealed a 6-2 win over John Henderson in the first round of the German Darts Championship in Hildesheim with a ten dart leg and then grasped victory over Mervyn King taking a very close game 6-5. This took me through to a third round clash with Andy Smith. I won a tight 11 leg thriller to book my place in a third successive European Tour quarter final. I then defeated Andy Hamilton 6-3, my winning leg 140, 135, 180, 46 out. I lost in the semi’s 6-4 to the eventual winner Dave Chisnall. I had a great weekend, love the format and am looking forward to next event. Thanks for all your support and your best wishes. Well I lost 10-8 to Brendan Dolan in the first round, I’m extremely disappointed with myself after working so hard to get there. I am now looking forward to the next European Tour in Hildesheim in Germany at the beginning of September and must focus all my efforts in to qualifying for the World Grand Prix in Ireland in October. Congratulations to Phil Taylor on his 14th World Matchplay Title, what a brilliant display of darts from both Phil and Adrian !!!!! Fantastic Television and great for all the Dart Fans !!!!! I had another great run in the in the 5th European Tour of the year making it to the Quarter Finals. 64 players across three days in the Tercentenary Hall at the Victoria Stadium in Gibraltar. First round I defeated George Federico 6-2, Second Connie Finnan 6-5, third John Henderson 6-5. 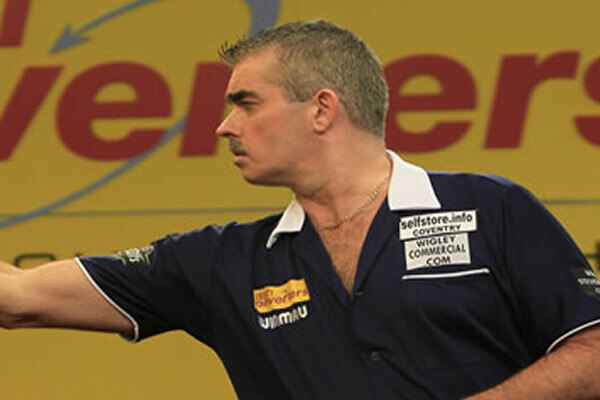 I then lost 6-0 in the Quarter Finals to Phil Taylor, I averaged 102 but Phil was in tremendous form and averaged 112. Phil went on to win the tournament beating Welsh Youngster Jamie Lewis 6-1 in the final. I’m now looking forward to my favourite tournament, The World Matchplay at the Winter Gardens in Blackpool and hope the draw is kind to me !!!!! Well I never got going in this event and missed far too many doubles. It just wasn’t my day and I lost to Joey Palfreyman 9-5. So I’m putting it behind me and am back on the practise board for Crawley and Gibraltar at the end of the month. May has been another busy month. I qualified for the European Tour 4 in Austria at the beginning of the month in Wigan and had a great run to the Semi’s in it at the weekend. This was held at Arena Nova in Wiener Neustadt. I played Erwin Freidl in the first round and won 6-4. I landed two 11 dart legs on my way to beating John Henderson 6-5 in the second. A 6-1 victory over Kevin McDine in the third set me up for a clash against another World Champion Jelle Klaasen in the Quarters. I won the battle of the Former World Champions 6-2 to reach my first European Tour Semi Final. My opponent was Mervyn King and he punished me for missing four match darts in the deciding leg. I was first to a double in the final leg but missed double 16 for a 102 finish and then three further darts at the bed, so Mervyn snatched the victory on double ten. Michael Van Gerwen defeated Mervyn 6-3 in the final. Congratulations to Michael who is a great player and is playing brilliant darts!!! The previous weekend I made the Quarter Finals at the Pro Tour event on the Sunday by defeating Keith Rooney 6-4, Dan Russell 6-3, Ian White 6-4, Ronnie Baxter 6-0, then lost to Andy Smith 6-3. Congratulations to Jamie Caven who had a fantastic double win over that weekend. I also commentated for Eurosport on the first round matches of the Dubai Duty Free Masters. I was part of a charity golf day in aid of the Afghanistan Trust hosted by The Wigley Group at the De-Vere in Staverton, Northamptonshire. Shame about the weather, we all came in drenched but a big thank you to everyone who helped to make the whole day such a success. I have also qualified for the European Tour 5 in Gibraltar at the end of June which is great news but first I am looking to take my present form in to the Speedy Services UK Open Finals at the reebok Stadium in Bolton later this week. I would like to say a big thank you to my sponsors Winmau and The Wigley group for their continued support which is really appreciated. I again made the Quarter Finals on the Sunday at the Robin Park Tennis Centre in Wigan after making three rounds on the Saturday. I started with a 6-4 win over Keith Rooney then Dan Russell 6-3, Ian white 6-4, Ronnie Baxter 6-0 and then lost to Andy Smith 6-3. Congratulations to Jamie Caven for a fantastic double win over the weekend. I am really pleased with how I am playing as I had previously qualified for the European Tour 4 in Austria and also the European Tour 5 in Gibraltar at the end of June. It’s great that I am still in with a chance of qualifying for a spot in the World Matchplay in Blackpool, so that’s good news. Jamie Robinson 6-4, Peter Evison 6-0 and Ken Macneil 6-5. The event will be held at the Maritim Hotel in Dusseldorf, Germany from 17th-19th May and I have drawn Ritchie Burnett in the first round. The following day in the UK Qualifier I made it to the Quarter Finals defeating Simon Burt 6-4, Joey Palfreyman 6-2, Peter Wright 6-4, Steve West 6-2, Dennis Smith 6-5 and then lost to John Part 6-3. This sealed my place at the Speedy Services UK Open Televised Finals at the Reebok Stadium in Bolton from the 6th-9th June. I’m looking forward to the Pro Tour in Wigan this weekend but unfortunately I have to play in the Qualifier on the Friday evening for the European Tour 4. Let’s hope I have another successful weekend. 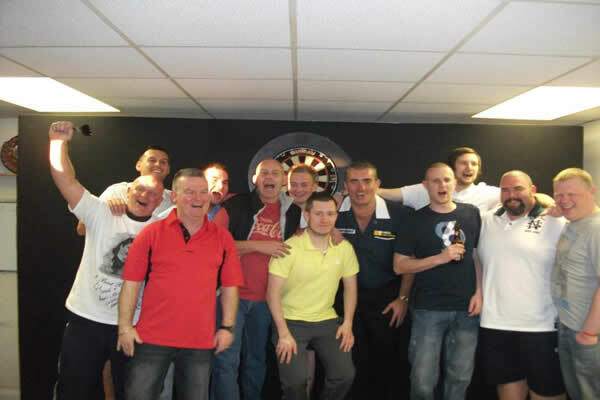 We had a great turnout for the Heart of Darts Charity Event at the Porters Lodge in London on Tuesday evening. At the last count the evening had raised £2,863.17 with hopefully more to come. Thank you to all who supported the evening and a big thank you to Paul Brown for all his hard work in organising such a successful event.